Have you seen, heard or know a Nigerian child who has exhibited great acts of bravery PHYSICALLY, SOCIALLY or INTELLECTUALLY? 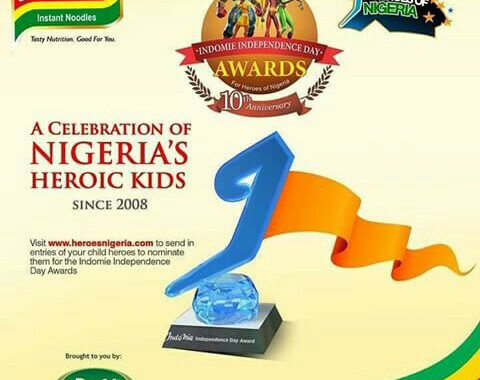 Because Indomie seeks to identify and reward heroic kids aged 15 years and below in 3 categories! You can also visit the Indomie Facebook page for more details. Entry closes by 31st of July, 2018. The Indomie Independent Day Award for Heroes of Nigeria is a Social Responsibility Initiative that seeks to identify, recognize, celebrate and reward the positive efforts, strong character, and achievements of young children between the ages of 0 -15years who have exhibited various acts of bravery and heroism at one time or the other anywhere in Nigeria. Indomie Independent Award is to encourage the acts of heroism in children who have made notable sacrifices at great risk to themselves and those who have strived to survive despite the unfavorable conditions they found themselves and have pushed the limits of courage and performance to a new level. To inspire heroism in our youngsters. To identify, acknowledge, and encourage children who have done any of these acts of bravery and made notable sacrifices without any recognition. The award category acknowledges kids (15 years and below) who at great personal risk, save lives or by their actions, prevent extensive damage to property or others. This award category celebrates kids who work against social evils such as child marriage, illiteracy and environmental concerns etc. in a sustained manner. This award category recognizes children with innate ability who have performed remarkably despite physical, mental, emotional or financial limitations.